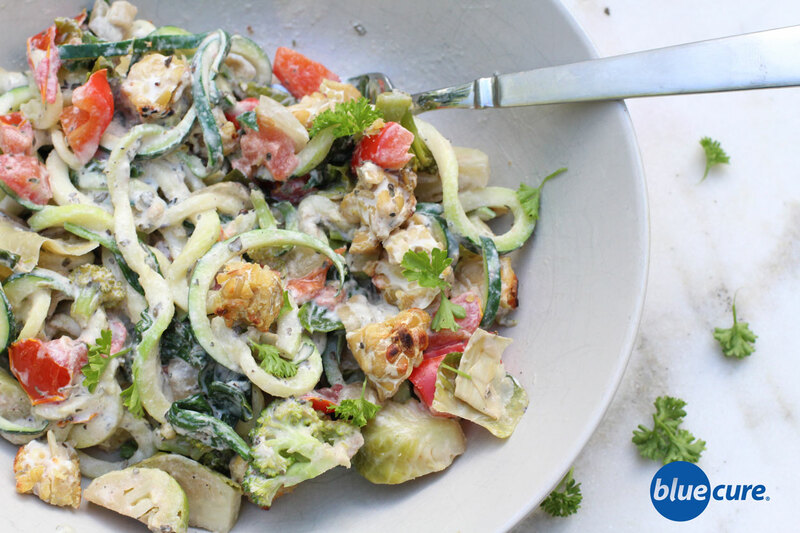 Lighten up your summer pasta salad with zucchini noodles and a garlicky- tahini based sauce. This dish may be lighter than most Alfredo dishes, but it is still rich, creamy, and sure to satisfy. Toss in cooked tempeh or even roasted chickpeas for a healthy, plant-based protein. For a more calorically dense meal, swap in whole grain noodles or protein-packed lentil pasta noodles. Tahini and tempeh are both good sources of plant-based protein and fiber. A 3 oz serving of tempeh has about 16 grams of protein, and also has 7 grams of fiber! While a tablespoon of tahini provides about 3 grams of protein, 1.5 grams of fiber. Wash and chop all the veggies except for the zucchini. Sauté the onion with 1-2 tablespoons of water. Then add the broccoli, pepper, and Brussel sprouts. Sauté until desired texture. Continue to add water as needed to soften the veggies. Add the artichoke hearts, greens, and sundried tomatoes. Allow the veggies to cook on low heat until the greens have wilted. Cube the tempeh. In a small pan, combine the tempeh with ¼ cup of water. Simmer the tempeh until the water boils off and then sauté the tempeh without oil until it’s lightly browned. In a bowl or blender, combine all the sauce ingredients and stir or blend the mixture. Set aside. Trim the ends of the zucchini and run the zucchini through a spiralizer. Option to leave the zucchini raw or to soften them in boiling water. If cooking, bring water to a boil in a pot. Then add the zucchini and cook for about 1 minute. Avoid over cooking or you will have very soggy noodles. In a large bowl, assemble all of the ingredients. Gently fold until the sauce is well distributed. Serve warm or chilled. Enjoy!